It’s a simple question isn’t it? The most definite answer is if it’s been involved in an accident. That much is certain. A helmet, much like the crumple zones in a car, is DESIGNED to break on impact. This helps dissipate the energy from the impact through the materials of the helmet and therefore reduce the amount of energy going to your brain. So, that’s a given. That leaves us with 2 further reasons to replace your helmet, dropping it and its age. Here it seems there are no definitive answers. Due to the fact the helmet is designed to break on impact does it not make sense that if you drop it from even hip height that its internal and external structure could be damaged? I am not going to answer that question on the grounds that I’m not a helmet expert and I don’t want you to sue me. Some people think that even a minor fall means curtains for the lid. Others believe that if it’s strong enough to protect your head in a crash then surely a drop off the workbench is not going to ruin it. Personally, in my opinion, minor drops are OK, but if it gets a good old whack of any kind then I’d be thinking it’s time to replace it. Here the best answer is not to drop or whack the thing, look after it carefully and don’t leave it in places it’s likely to fall or get whacked. The EPS Liner is not to be confused with the comfort foam, that’s padding much like you find on your settee. So you have the padding, then the EPS then the shell, usually fibreglass or some modern plastic. It seems the EPS is the thing that ages, that wears out, that loses its protective edge. It does make sense. You put your lid on, take it off, you stuff your gloves inside your helmet then take them out, you lend your lid to a friend who’s heads a different shape and so on and so on. All the time that layer of foam is compacted a tiny bit more each time, until it gets thinner and offers less protection. Also the comfort foam, like a settee’s foam, gives up with age. Eventually you reach a stage where that once tight and snug lid rolls around on your noggin. If it’s getting loose it must be time to replace. Some manufacturers recommend replacement as often as 2 years, and as little as 5 years. How you can put a time scale on such things is curious though. What if you only use your helmet once a week and only during summer? You may, in 5 years, only wear the helmet 50 times. Yet if like me you ride most days, rain or shine, I may wear a helmet 300 days a year and be putting it on and taking it off all the time. I can only assume these figures are “guides”. One thing that most safety types and helmet manufacturers agree on though is that about every 5 years the technology has moved on enough to create better helmets which may just make it worthwhile investing in a new one. How much of that is marketing hype I am unsure. The most important thing is helmet care. Apart from making sure it does not receive any impact, be sure not to use any solvents or strong chemicals. Why? Take a Styrofoam cup from a café and put it near petrol, thinners, nail polish remover, strong cleaners or anything else like that and watch it melt and go all gooey. The EPS liner is hidden for the most part but parking your helmet on a petrol tank cap means the fumes are breaking down the polystyrene. Wash your helmet with anything stronger than watered down washing up liquid and the fumes or odd splashes will eat the liner. Also get out of the habit of stuffing your gloves inside your lid. Each time you’re collapsing the EPS a little bit more. Don’t hang your lid on the mirrors as the sharp edges collapse the foam a little more. I guess the only thing inside your helmet should be your head. Your head is important, if in doubt, get a new helmet. Sun exposure also play a big part. UV radiations make plastic age quicker. So 5 years (or more) on a shelf is ok but a daily use is seriously to take into account. That's why I never buy expensive helmets, I only need them to be certified up to regulations. Like Ren says, "your heads important"! On the life thing, I had a spare Arai FV (I think) in its bag, box and brand new never worn. The helmet was a spare but got forgotten about and left in a dark store at a temp of 60 to 70 degree's f.
It was there for about 5 years until I moved something and found it. My joy over'runneth and I started to wear it. Within 6 months and 5000 miles the thing was falling apart, vents fell off, rubber seals disintegrated, the foam interior fell off the cloth. It was a mess. I must have resembled that car on the Keystone cops where the bits fell off it as they drove along. So yes, good advice, your head deserves better. Aria is supposed to be a top range helmet! I should be surprised but we've several reports on here regarding poor quality in expensive lids. As long as a helmet reaches good basic standards (EU regulations) then the quality of the fit for your individual shape of head is more important than the price. Absolutely Ren - people used to say "buy a cheap helmet if you have a cheap head". Absolute nonsense. All helmets on sale are perfectly adequate and indeed some cheap ones perform better on things like the SHARK test. The thing I will keep on harping on about is the FIT! There's no point having a 5 star SHARP (not SHARK) helmet if it only touches you on 2 points of your head. It needs to be snug but not tight over as much of your skull as possible. 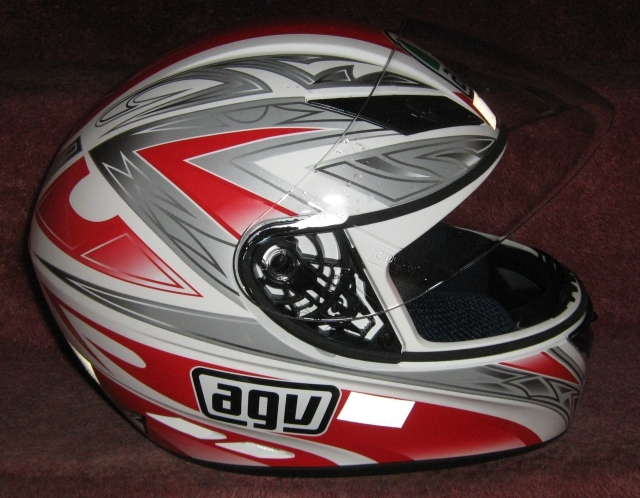 If a £50 helmet fits perfectly and it is correctly approved then that is better for the individual than a £300 lid. Of course you could be unlucky and find the very best fit for your noggin is a £300 helmet. I'd also mention - best to stick with reputable dealers. I am told there are some rather horrific and thoroughly dangerous counterfeits out there. If it's cheap ask yourself why. If anyone is considering changing theirs anytime soon, then consider one with a drop down sunny. Had a Shoei GT Air at the start of the year and the drop down is amazing, I didn't realise it but my life wasn't complete before. Through long tunnels and extended lines of dense trees it is a god send. When riding in area of continental Europe where there seem to be more tunnels than not on some roads especially in the Alps/Dolomites/Pyrenees etc it is truly the best bit of safety kit you can have. Lots of manufacturers have options for drop downs now and it's well worth the effort to track one down that fits well. You didn't have a "positive" experience with your Schuberth helmet did you Pocketpete! I agree Upt'North. My last few helmets have the pull down sun visor and they are indeed a godsend. Let me tell you a short story. While thoroughly enjoying the delights of a tiny French corner of the Alps I had sunglasses on. The sun was bright and the reflection off the snow was brighter. Then I happened upon one of the many short tunnels in the area. I was, to all intent and purpose, now blind. Dark tunnel with dark shades is not a combination conducive to healthy visibility conditions. I almost came to grief while flipping up the visor and trying to pull the sunglasses down my nose to clear my vision. There's bends in them there tunnels. Apparently. I couldn't see them. Swiftly retractable sun visors are a godsend in these circumstances. Be sure the design DOES allow swift retraction though. Recently changed my Helmet to an HJC flip front with internal sun visor. Excellent piece of kit, 4 star rated by Sharp and around 170 pounds. So far had no problems with it, I wore it in the shop for 10 mins doing silly stuff in a corner to try and get it to move about or steam up, to no avail. Noise wise it is okay I believe. It's quieter than my last helmet and as far as I know no noisier than any other flip up. I find the Sharp website an valuable tool in assessing the quality of a helmet as there are several much more expensive helmets of the same type listed that have a lower rating. Unfortunately things like wind noise and aerodynamics aren't part of the test so you can only go on other peoples experiences as far as these points are concerned. Marketing hype such as "Tested in a wind tunnel" means nothing as there is no quantitative value given for the test, wind noise decibels at 70mph, drag coefficient, wind plane area when angled more than 30 degrees from facing forward etc. I also bought a 30 quid UBER flip front for using during my lessons as I didn't want to have to fart about removing and replacing my intercom system every lesson and I wouldn't be going particularly fast during my training, (the HJC has slight recesses for the speakers). The UBER was everything you expect from a 30 pound helmet, but it would protect your head as per the minimum standards. On the way back from the test center I hit 70 and discovered that the UBER when doing a life saver at that speed had the aerodynamic qualities of a plank of wood and was trying to snap my neck off. Talking of the Sharp tests. My first helmet wasn't in the system and I requested through their website if they could do it. About 8 months later there it was in the system, all 2 stars worth of it which I thought was a pretty good response time from a government department. The problem with testing for sound levels is no-one's body is the same. You could have a standardised head and shoulders config for a baseline but this misses the point. You might have sloping shoulders and wear a light jacket. This totally changes the air flow compared to a square shouldered chap wearing thick jackets. While some noise comes from the helmet shape a lot comes from the helmet - neck - shoulder area too. It's the same for misting. Different folk's clothing and body shapes and the way they sit and the style of the bike all must affect air flow into the face area. I could have designed the perfectly quiet yet well vented non misting helmet only for you to ruin it by wearing a different kind of scarf! I guess this is why no-one ever agrees on forums.